Arriving home early this evening, around 4:30 after a busy day pet sitting, I followed a Larimer County firetruck, dispatched from Country Club & Terry Lake Road, almost to my doorstep. They pulled in next door and were soon joined by two Sherriff’s Department vehicles, another fire engine, and an ambulance. Everyone headed for the partially frozen pond next to my house, just East of Terry Lake. Parking, I hurriedly walked back and arrived at the shore just in time to see a rescue worker sliding across the ice on his stomach, before plunging in to the icy water near a large, struggling dog. 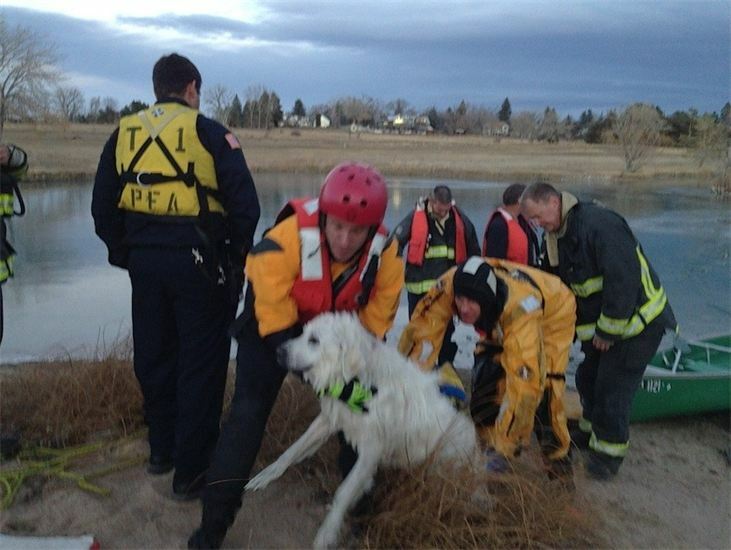 After just a short while, the rescuer had the dog’s front legs under his forearm, and rescuers on the shore began to pull both of them in using a safety line. Myself and a bystander both gasped, as the dogs head went under the water for approximately five seconds as it neared the shore. With one final heave from rescuers on shore, they were safely out of the water! I went to the dog to try to get a feel for his body temperature. We were rubbing the dog and the poor thing was just ice cold. It was clear the dog was hypothermic. The poor dog was shivering, seemed confused and had difficulty trying to stand. They rushed the dog to the CSU Emergency Vet Hospital. I gave them my card, as I believe the dog belongs to one of my neighbors behind the pond. I understood from a rescue worker who called me enroute to CSU that they didn’t know who the dog’s owner was. They said they would call CSU to inform them. I sent a brief news release to Channel 9 News with photos in the hopes they would air pictures of the dog. Hopefully someone will see these pics and be able to notify the owner! The dog looked to be some sort of Pyrenees-cross. Please pass this news on to your friends. Hopefully the community can help identify this poor dog! And a big, big “thank you” to all the Fort Collins Emergency Responders! I had no idea the calvary would come out to rescue a dog! UPDATE: As of 7:30pm, sources at CSU Vet Hospital say her temperature is now up to 96 degrees, she has a small puncture wound, and they think she’ll be just fine! Also, they found the owner! YAY!! Thanks to everyone who spread this story around!